Want to be notified of new releases in iakta/hugocockpit? It is a simple addon that will generate content for every collection in a Cockpit NEXT CMS. The idea originated from Hugopit, a project to use Cockpit (the old version) as a fronted to Hugo, on https://github.com/sjardim/Hugopit : part of the code is copied from there, but not many anymore. Thanks anyway. They both need to be installed on the same file system. Simply copy the downloaded folder tree under the base directory of your Cockpit installation, in the addons subdir, like this: <cockpit_base_dir>/modules/addons/Hugo or <cockpit_base_dir>/addons for later versions. IMPORTANT: if cloning from git, remember to rename the dir hugocockpit to Hugo (with capital H). Upon reloading Cockpit CMS you should find another menu named Hugo (the H in the hexagon icon). The first time it will launch an automatic Installer. Please fill in the required data (basically the only required data is the directory where Hugo is installed on the machine where Cockpit is running). At the end the installer will modify Cockpit settings, Hugo settings and write this plugin settings too.. Then just create a new user belonging to the group specified in the installer, and log in in Cockpit with this user it to fill in the entries/pages and to use the Hugo Plugin. 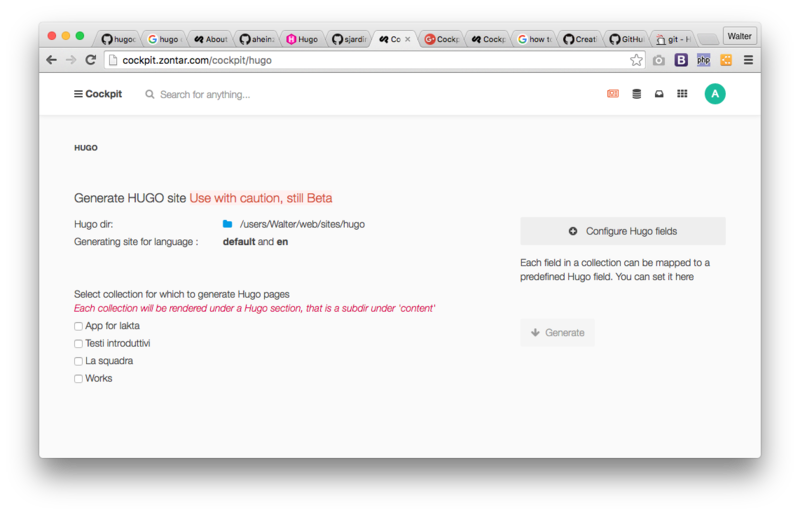 Once the Installation is done, the Hugo icon will bring you to the normal hugo plugin page. Plugin with multiple hugo installations? Should work with multiple Hugo repositories, provided you change and set different hugo base dir each time.. Interesting idea for a future enhancements. This can also be done by hand editing a file named config.yaml in the root dir of this addon, or via the Settings file button on the lower right hand corner. and this one is needed for images to work correctly. Please use any path under storage, just take note of it. Hugo need some Cockpit configuration to run: in particular it is best to create a group, and a user, that will be the editor of the site, without all the privileges of the admin user. This will create a new group author (or whatever name) with some privileges, and most importantly, will set a finder.path. This can be whatever you want, under the cockpit_storage_prefix direcotry as set in the hugo config file. Then create a user belonging to the newly create group, and give it to the editors, or use it to login in Cockpti to edit the site for Hugo. Back in Cockpit, open up the Finder and create the dirs and subdirs as needed under storage. Or whatever dictionary you want to have. The key (in this example "en" and "fr" will be the names of the subdirectories created by the Hugo plugin under the publishing directory. LANG will be "en" and "frCA" etc.. Of course remember to have at least some fields configured as "Localize" while creating fields for a collection. Hugo entries in collections can be exported as plain Hugo files, or you can specify some fields as to translate to special Hugo fields, that will appear in the frontmatter or as the content. You can do it from the main page, with the big button Configure Hugo fields. Here, for every collection, you can see the fields and decide wether to give them some special name. If you give them some special name, the field value will appear in the frontmatter of the Hugo page with the name you have chosen If you specify content it will appear as the page content.. If you don't choose any special name, the field name will be used and the field will appear in the frontmatter. 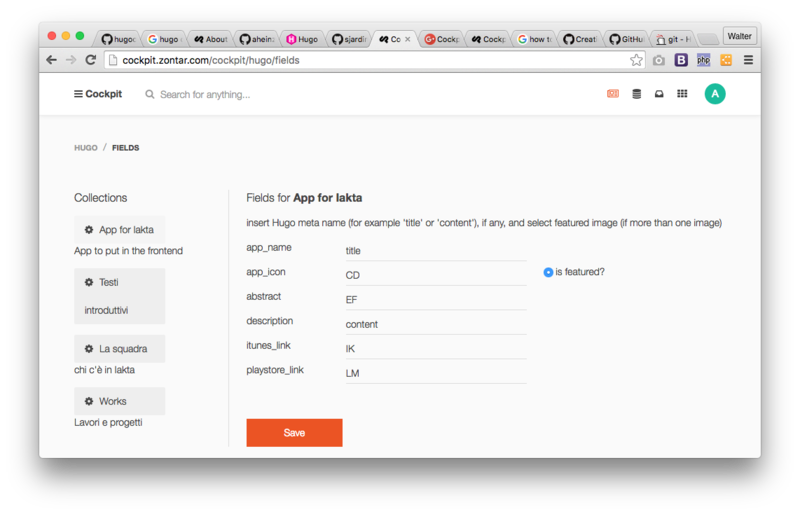 You can also specify a featured_image if you have more than one image in the collection fields. Of course, you can specify also standard hugo frontmatter names, they will be translated. Some names have special meaning for the plugin: At the moment recognized frontmatter special fields are title, slug (the name of the generated .md file), date, publishdate and of course the content: content. These values will be stored in the JSON parameter of the Hugo field, under the hugo keyword. Please note that the author user won't be able to edit the Hugo settings, since it will be outside of its finder base path. Only root user can edit it, and it also make sense. So it will copy over the static images as used by cockpit when building the Hugo site. Most problems are due to write permissions. Please ensure that the folder (and subfolders) where Hugo will run and put output files, can be written by the user that runs your web server. A command like that (change paths and users according to your setup) should be enough in most cases.